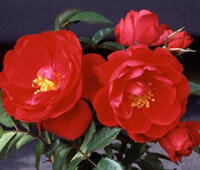 The rose Henry Kelsey was first bred in Canada prior to 1984 by Dr. Felicitas Svejda. Dr. Svejda worked for Agriculture Canada's department of research where she extensively used rugosas to create varieties of roses that were extremely hardy and were later named after Canadian born explorers. 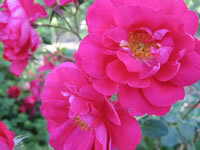 The Henry Kelsey was created by crossing a generic seedling with a hybrid rose of the Rosa kordesii. 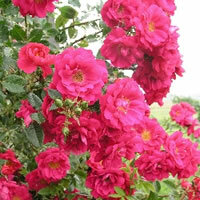 The result was a hardy, shade tolerant climbing red rose that carries a fragrance of spices. Henry Kelsey roses will not grow quite as tall as some other varieties of climbing roses, but they will grow anywhere from 4 feet to 10 feet tall. Many growers would consider that a miniature climbing rose by comparison to the average height of other varieties. This short stature makes the rose Henry Kelsey actually pretty versatile in the garden as well as in containers for your porch or patio. Since this variety was bred in the colder northern climates, not surprisingly it carries with it an unusual hardiness to those temperatures and can do well in zones 2 and warmer. 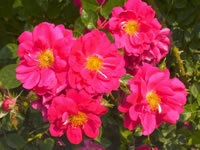 The rose Henry Kelsey will expend a lot of its energy on that first big bloom of the season, however if grown in the proper location you will see scattered blooms throughout the rest of the growing season. Like most repeat bloomers, you will get the most bang for your buck, so to speak, if you can provide them with a location that gets a lot of sun light. A good rule of thumb is at least 6 to 8 hours each day, but more is even better. You should also try to get them a spot that gets the full morning sun light as this will help to dry out the leaves quickly. Henry Kelsey roses are somewhat susceptible to blackspot so you will need to take care that they do not stay wet for long periods of time. Make sure that the garden soil drains well and good air circulation will also go a long way towards keeping the leaves of the plant dry. When you water the rose Henry Kelsey, water the base of the plant only rather than soaking the leaves from the top down. This will help to minimize the exposure to excess moisture on the leaves. Planting the rose Henry Kelsey is really easy and you'll find it doesn't take an expert gardener to get the job done. Before you do any digging however, I recommend that you take a trip to your local garden center and pick up a bag of a good organic compost. When you dig the hole, mix the compost in with the loose soil at a ratio of 2 parts soil to 1 part compost. Use this as your back fill and you will be amazed at how quickly your rose Henry Kelsey establishes itself in its new home. Once you have the hole dug, set your rose Henry Kelsey on top of the mound of soil and spread the roots outward in all directions. Then back fill the hole about halfway to start, using your new soil mix. Take the garden hose and water the loose soil heavily so it flows around the roots. Back fill the hole the remaining way and water it heavily one last time to firmly set the soil. Taking care of the rose Henry Kelsey is pretty straight forward. As I said earlier, you have to make sure that you monitor its moisture level so that you are not making it overly susceptible to blackspot and other diseases. One deep watering per week should be sufficient for most areas, but if the soil is not drying out sufficiently between waterings, space them out accordingly. You should give your Henry Kelsey roses a dose of a good granular all-purpose fertilizer in the early spring when the leaves begin to bud. For repeat bloomers such as this, you can give them another dose right before the first big bloom starts to open, and then another dose later on in midsummer to promote later blooms. Pruning the Henry Kelsey should be done in early spring before the leaves form so you can see what you are doing clearly. Start by removing all the dead wood, along with any canes that are discolored from disease. Next, prune back any canes that are overlapping one another as much as possible. This step is sometimes difficult on climbing roses, but the more leaves that have direct exposure to sun light, the better the plant will do. Lastly, prune the remaining canes for the overall shape you want, and tie off the canes to your supports. This is also the time to rake up around the base of your roses so that you are not leaving behind any dead leaves or debris. Dispose of all this material, along with your cuttings, in the trash. Never throw them into the compost pile as many spores will survive even the cold winter months and quickly reinfect your roses the following year. I always finish up my pruning by giving my roses a fresh layer of mulch to start off the year.